One in a while we come across places that are truly worth more than what we expect it out to be. Shimla British Resort is one such beautiful place that I got to stay in during our recent vacation to Shimla. P.S. Scroll to the bottom of the blog post to check out the video giving a tour of the property. What is so special about Shimla British Resort? 1. Made in 1823, this property was home to the chief architect of the Viceroy of India. This British architect lived here with his two wives, one Scottish and the other British. The best part about this heritage property is that most of the structures have been kept intact since the beginning. You almost wake up to a life that takes you back a century. 2. It’s close proximity to the Mall Road in Shimla is another key benefit to living here. In a matter of minutes, you can immerse yourself in the hustle-bustle of the city and then come back and retire to the most serene peaceful evenings at the resort. 3. They have some adorable rabbits and geese that run around the property all day along. If you can befriend them, by all means, give it a try. They are good entertainment to keep little ones engaged. 4. The in-house catering is fantastic. One of the things that I loved about Shimla was the food, and Shimla British Resort didn’t fail to impress. On a cold morning, hot paranthas and chole bhature, it’s pure bliss. Do give them the opportunity to serve you one meal, you will be a happy customer, I assure you. Back in the day, apparently Ruskin Bond wrote few stories based on this property. I haven’t sat down to locate those yet, but if and when I do, will update the same here. What does Shimla British Resort look like? 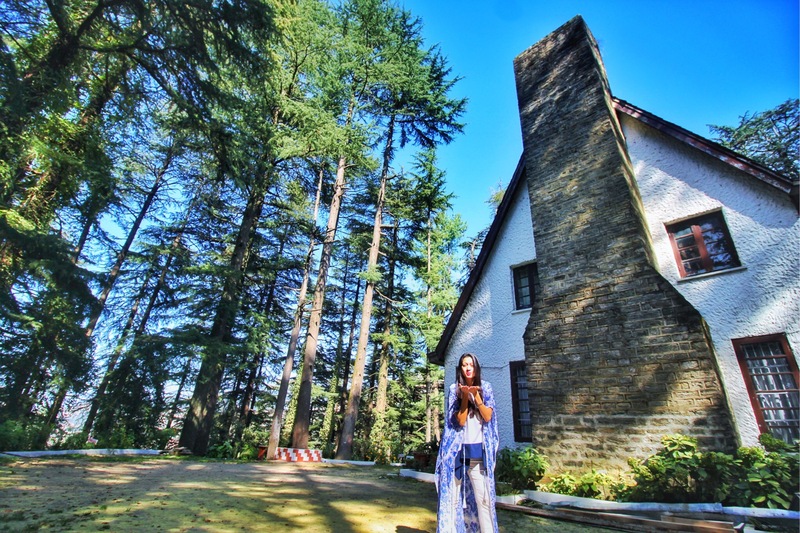 Surrounded by dense Deodar trees all around, this place is truly magical. The resort is the sole property on the cliff of a hill overlooking some stunning views of the city. Don’t miss out on the walk from the back exit to Army Heritage Museum from here. It’s the most pristine walk through the forest ever. The location of the resort. If you are not someone who is fond of walking, i.e. walking up and down a hill, then commuting might be an issue for you. While the resort does provide a drop to the plain main-road uphill, on the way back, unfortunately, one has to walk it down completely. Something to keep in mind in case you are traveling with the elderly or with children. What are the charges for Shimla British Resort? Different travel portals have different price points. We booked through Goibibo and got a great deal of INR 2500 a night which was pretty decent for this property. In case you are planning a family trip with a big group, I highly recommend staying in the big Scottish Villa. That rents out for somewhere around 25k but it also boasts of 6+4 rooms, a hidden attic leading to what I can a romeo juliet balcony and has a private garden as well. Totally worth it. Check out the video below to get a closer look.